Look Who Else Is Back! ‘The Flying Scotsman’ wasn’t just a dodgy King’s Cross strip-pub. It was a train built in Doncaster, South Yorkshire, in 1923, and it soon became the star locomotive of the British railway system, pulling the first train to break the 100mph barrier in 1934. 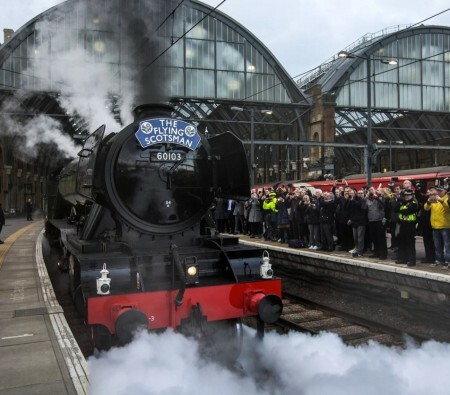 This morning I awoke to the sound of a helicopter filming outside my bedroom window; the Flying Scotsman was leaving Kings Cross station just after 7.45am on the trip north to York. The National Railway Museum in York bought the locomotive for 2.3 million in 2004 before work got under way on its restoration in 2006, and now it’s back, and will be touring around the country. All trips on it are now sold out and as far as I can see it won’t ever be in service, just in a museum, which is sad but necessary. As for the other Flying Scotsman, see ‘London Gets An Old Pub Back’ in the blog. What a great sight that is.Shame about those add-on smoke deflectors, although this is probably a bit nit-picking. Thats funny in a sad sort of way, to spend so much money on something that is going to sit idle in a Museum for the rest of its days. Why couldn’t they have just given it a lick of paint and housed it in the shed? It might not sit idle. It did makes its way from London to York. It’s posiible in years to come that every now and then they take the ole girl out for a run. And besides it’s wonderful that it’s an actually working, fully functional model. Personally I find it sad when I go to museums and find, for example the clocks don’t work. It seems such a terrible shame not to keep something in working order. Restoration jobs like this also keep people employed, which is always a good thing. Puts money back into a local industry and community. In Paris there is a wonderful museum called The Musée des Arts et Métiers that has a superb collection of automatons. But what makes it especially interesting is that they work. You can sign up for a special demonstration of some of the models. Now if they simply sat there they would be less interesting…..beautiful, yet lacking in some way. To see them functioning and performing their wonderful little trucks is really wonderful. We have a steam engine called the Royal Hudson which pulled the royal train across Canada in 1939. I don’t know how many of that model exist but we have one in the railway museum in Squamish. For a number of years there was a train that ran from North Vancouver to Squamish and was pulled by our Royal Hudson. A steam engine has to pass regular safety checks and the amount of work required to keep a boiler in full proper order is considerable. Eventually the work becomes just too expensive for a revenue requiring road to manage. The Hudson is undergoing restoration/repair by the volunteers of the museum society and while it may run again there is certainly no promise of it. I would dearly love to see the Flying Scot. They may be able to do that if there are enough people willing to pay the price to ride behind her and donate to her maintenance. Good luck to her. My husband says he’s been following the repair/reno and thinks that the engine will run, no matter what. I think he’s a bluebird optimist but he may be right. It doesn’t improve machinery to sit idle. Chuck in some spare change.